Are you planning a child's birthday party? Are you in charge of lining up entertainment for your school's Spring Carnival? Is your neighborhood block party coming up? Do you need something all ages can enjoy at your upcoming company picnic? Any special event can be made more special with the addition of inflatables. Quite literally, bounce houses and other inflatables are instant fun. Simply plug in the motor and within minutes you've got an attraction that lures both the young and the young at heart. Here's How to Really Pump Up the Fun Factor! Inflatable bounce houses and slides are fun. However, they can get monotonous. Each time you step into an inflatable obstacle course, on the other hand, you'll experience something entirely unique! Willie Fun Events has two huge obstacle courses to choose from. Our 55x15x15-foot course is packed with pop-ups to get over, under, or around; tunnels to climb through; a giant climbing wall to scale; then a slippery slide to bring you to the finish line. 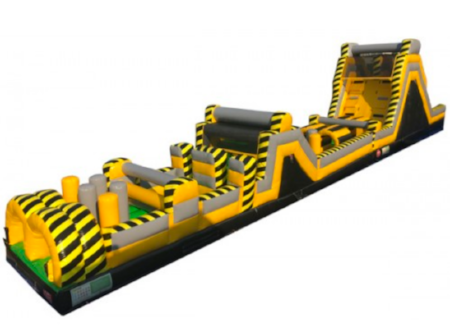 Our 74x15x17-foot Extreme Ninja course is the largest inflatable obstacle course available in Milwaukee! Its double-lane pop-ups are ideal for friendly competition. After the pop-ups, there are two climbing walls then a giant slide to the bottom. Keep Them Busy, Wear Them Out and Keep Them Motivated! Break your group into teams and have a tag-team style race through the course. You could have each team wear a different color T-shirt to boost the team spirit factor and provide fun prizes for the winners. Time each individual as he or she goes through the course, encouraging them to complete it as quickly as they can. Present first-, second- and third-place winners prizes, ribbons or medals. Use the inflatable obstacle course as the centerpiece of a larger obstacle course you and your party-planning crew create! You can incorporate a baby pool at the bottom of the obstacle course slide, a mini trampoline, jump ropes, hula hoops, pogo sticks … the sky's the limit! The more creative, the better! If you're looking for an attention-grabbing addition to your next event, whether it's a small event or a large event, check out our inflatable obstacle courses today!